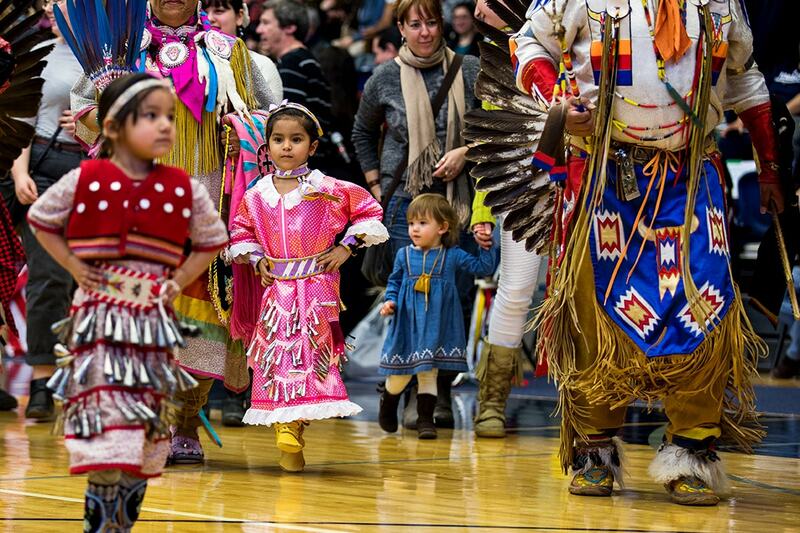 Hundreds of people in a rainbow of colours filled the Goldring Centre for High Performance Sport at the University of Toronto on Sunday for the Indigenous Studies Students' Union's powwow. The celebration was the second in a row at the university, following the ISSU's massive powwow – the first at U of T in decades – at the Athletic Centre last year. “Powwow is about family – whether that’s the powwow family or the University of Toronto family,” MC Bob Goulais, from Nipissing First Nation, told U of T News. “Having a university that supports cultural knowledge, Indigenous traditional knowledge, and puts on events that welcome and feature students is such an important thing,” Goulais said. The powwow was also an opportunity for non-Indigenous people to learn about the diversity of Indigenous languages and cultures, he added. He said he hopes visitors would take an interest in more than what met the eye, including the personal stories of the singers, dancers and elders involved. Ryan DeCaire, an assistant professor at the Centre for Indigenous Studies and the department of linguistics, spoke at the powwow with students from his Kanien’kéha (Mohawk language) class. They took turns saying the Ohen:ton Karihwatehkwen, a prayer that roughly translates to “the words that come before all else” and gives thanks to the elements of creation. DeCaire, who is Mohawk from Wáhta Kanien’kehá:ka Territory, just east of Georgian Bay, learned the language as an adult. He's trying to pass it onto future generations through full-year courses at U of T. The language and its inherent knowledge are in danger of dying out, he said, as only about 1,000 fluent speakers remain in North America – and many of them are elderly. He said he was touched by the large turnout for the powwow, to see hundreds of people come together to celebrate Indigenous culture and traditions. Jenny Blackbird, an artist, hand drummer and singer of Nehiyaw-Finnish background who works for the Centre for Indigenous Studies, said the event shows great leadership by ISSU, the students and volunteers, who are helping build a community at U of T.
Ziigwen Mixemong, the head female dancer and membership support coordinator at ISSU, said she was almost overcome with emotion during the grand entry. “My mom and dad were both there and I literally couldn't look at them or I'd start to cry,” she said. The highlight of the event for her was seeing young children and students participate in the intercultural experience, which attracted people from as far as Thunder Bay and incorporated Métis jiggers, Inuit throat singers and Aztec dancers. Her opposite number, the head male dancer, was a faculty connection: The role was filled by Amos Key Jr., an assistant professor at the Centre for Indigenous Studies and in the department of linguistics. ISSU executive member Olivia Miller was in charge of managing the 40 volunteers for the event, but was able to pause briefly to watch the fancy shawl dancers from the mezzanine overlooking the gym. She and the other student organizers – Mixemong, Joshua Bowman, Julia Mogus, Grace Webster, and Jennifer Sylvester – are planning a debrief meeting soon so the next executives can plan an even bigger powwow next year. Speaking a day after the event, Mixemong said she was still sore from all the dancing. “Adrenaline and pure joy were feeding my soul,” she said.